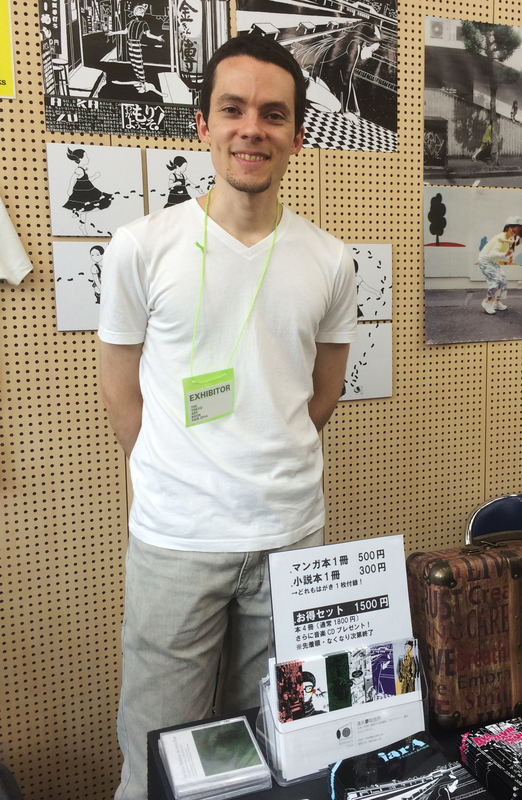 Angelo Levy at his booth at Tokyo Art Book Fair 2014. Angelo Levy is a Brazilian manga artist, part of the Wonderworld team. He also organizes the Tokyo Comic Artists meetup which is a great resource for anyone interested in Manga, particularly for foreigners due to the international make-up of the members. He kindly took some time to talk with me at the Tokyo Art Book Fair 2014. Where are you from and what brought you to Japan.? I have been in Japan for 8 years. I first came to Japan in 2000 as a high school exchange student. After majoring in Fine Arts and Animation in Brazil, I got a scholarship to do a masters in Animation in 2006 in Japan. How did you transition from animation to manga? I was interested in comics as a student and took comic drawing classes in Brazil. During university I was into animation but after I realized my biggest passion is comics. They seem more accessible. They have more room for imagination. The reader has to participate more actively. You can have your own pace as a reader. You mentioned that this is your first time at TABF, what do you think? Many people from the creative field are here, so the understanding of art is a bit better. At Comiket (a comic market held twice a year in Tokyo), people are looking for comics so something different is more of a surprise. Here people are not surprised by something different. I’m working with fairytales, adopting them to modern Tokyo. The visual is contemporary but the structure is the oldest you can research. Cover of Akazukin Chan. A modern retelling of Little Red Riding Hood, set in Tokyo. What are two things you want people to know about your work. First, fairytales are not meant only for kids. As adults, it’s interesting to take a look at them again and think about what are the deeper messages. What is it that makes the story immortal? They work like symbols. Depending on how you look at it, you can learn different things. Second is connected to using black and white in my manga. Today there’s a tendency to have realistic content but on the other hand, it’s entertainment that won’t stimulate your imagination. So by working with black and white, the reader has more room for imagination and therefore, more interaction with the work. Thanks for your time! Do you have a website where we can see more of your work? This entry was posted in art, bookmaking, creativity, drawing, Interviews, Japan, writing and tagged Akazukin Chan, Angelo Levy, comics, comiket, Drawing, fairytales, illustration, Little Red Riding Hood, manga, Tokyo, Tokyo Artbook, Wonderworld. Bookmark the permalink.